Information and instructions on Genbook's Optimizer and Last Minute Bookings features. 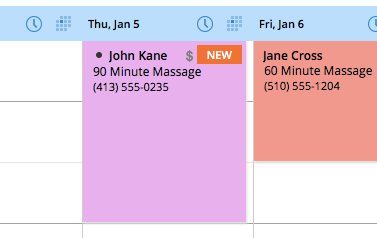 Genbook's Optimizer shows you how busy your business is at a glance, and helps you fill expiring empty appointment slots with Last Minute Bookings. 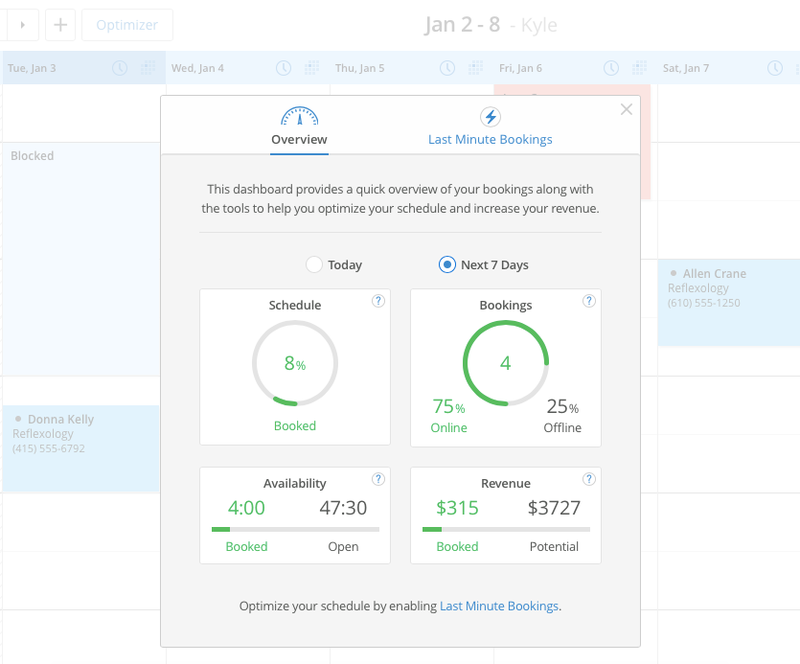 The Overview lets you see how much of your time is available for either the current day or the next 7 days, as well as your projected revenue (based on booked appointments) and your potential revenue (if all the time slots that are empty were booked). 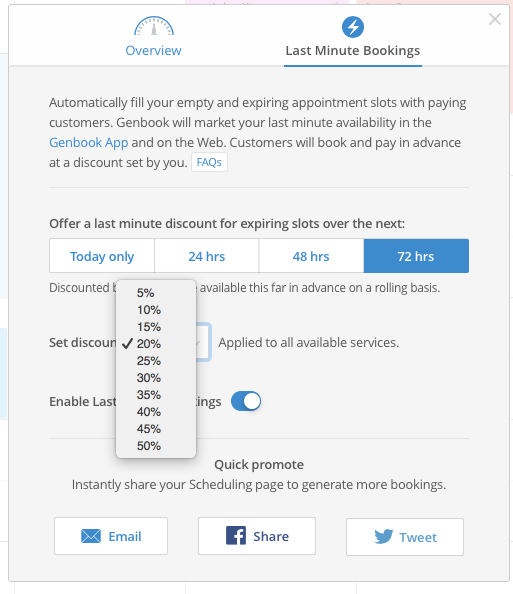 It also breaks down your appointments to show you the percent booked Online (by clients, using your scheduling page or the Genbook app) and Offline (by you, using either the Genbook website or the Manager app). 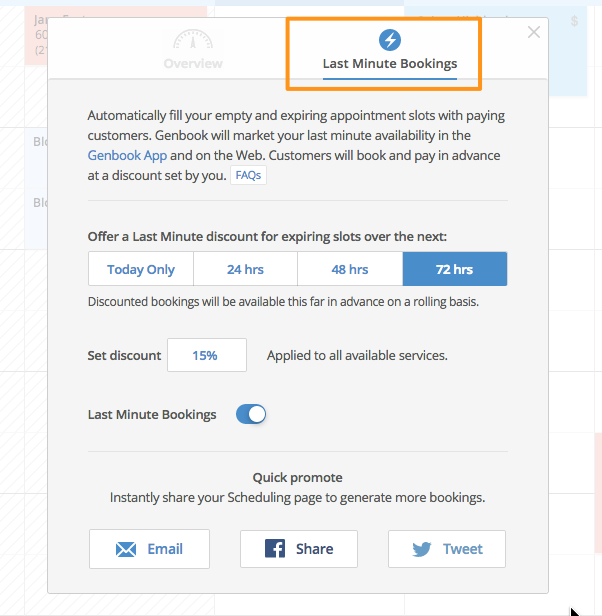 If your schedule is less full than you'd like for the immediate future, the Last Minute Bookings portion of Optimizer can help. 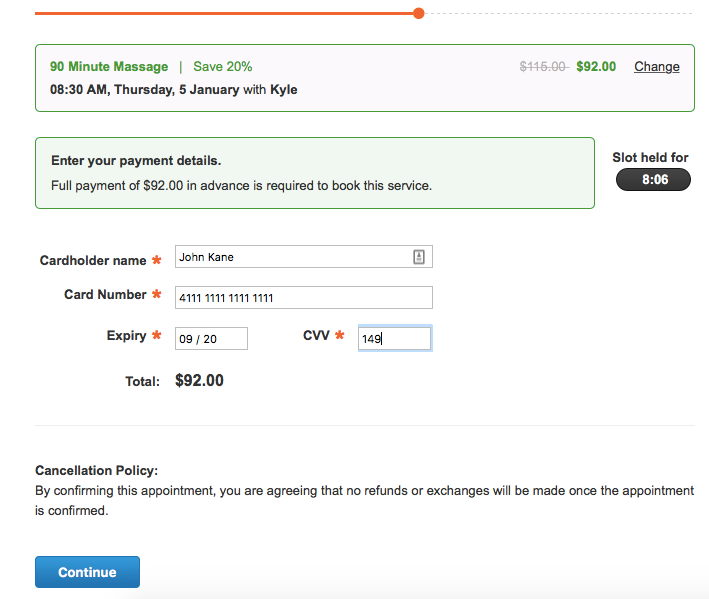 This feature lets you offer expiring, near-term appointment times at a discounted rate, and collects payment upfront for those bookings. First make sure that you have turned on Genbook Payments in Settings. Once Payments are enabled, click on the "Optimizer" button at the top left of the Calendar, then on Last Minute Bookings. You have the option to offer discounts on just same-day appointments, or ones made within the next 24, 48 or even 72 hours, on a rolling basis. You can discount the services anywhere from 5% to 50%. Discounts will apply to all the services you offer, across the board. TIP: You can quickly share and promote your Last Minute Bookings via email and social media. 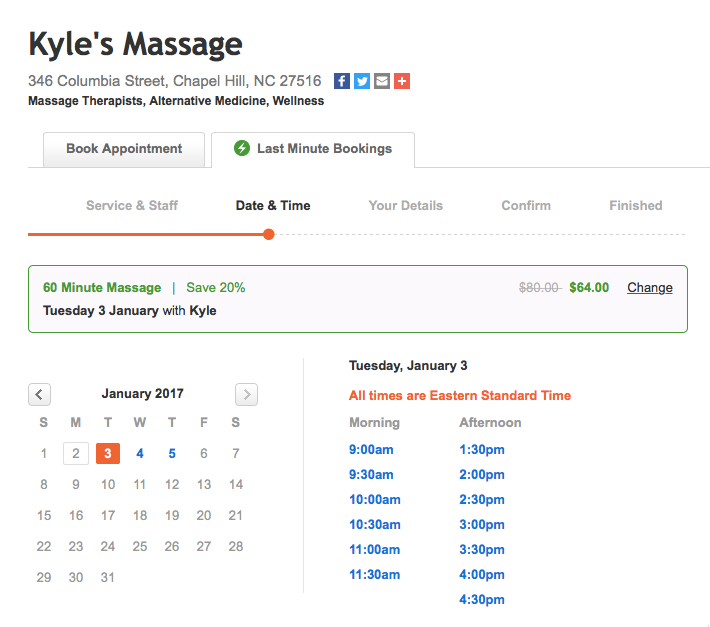 Customers going to your Online Scheduling Page will have the option to select either your regular services in the "Book Appointment" tab or the "Last Minute Bookings" tab for near-term booking of the same services, at the discounted rate. The regular and discounted cost of the service will be displayed alongside the service. The rest of the scheduling process works the same way it does with regular bookings. Clients first select a service (at that discounted rate). Then, they choose a date and time for their appointments, but are limited to just the time frame you selected (same day, 24 hours, 48 hours or 72 hours). Last Minute Bookings will appear in your Calendar like regular appointments, but the "$" icon lets you know that a payment has been collected. We’ll also be adding a lightning bolt icon to Last Minute Bookings in the very near future to make them more easily identifiable. 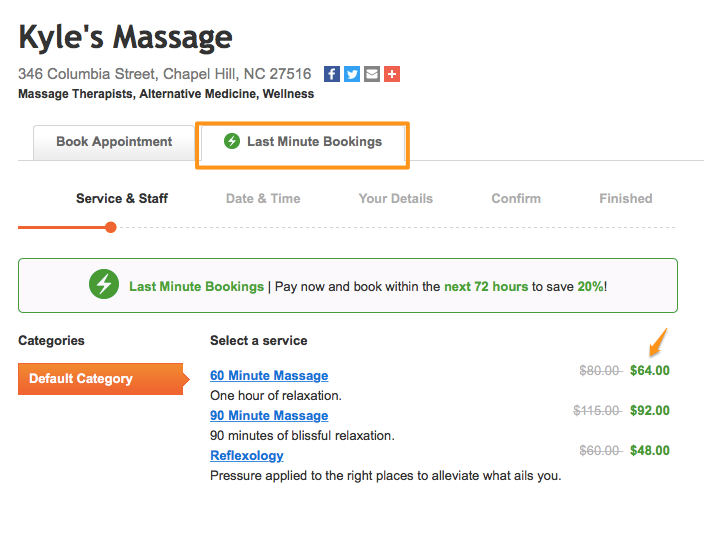 Because Last Minute Bookings turn time slots that would've otherwise expired (and earned $0) into booked appointments that are paid for in advance, there's a small success fee of 8% for each booking (applied to the discounted price) that's purchased and booked via this feature. Regular credit card processing fees for Genbook Payments will also apply. Offering a last minute discount is a great way to stand out from the local competition, and an amazing opportunity to make a new client connection.